New for 2017! TECNIS® Symfony Intraocular Lens including correction for distance vision, near vision, & astigmatism with cataract surgery. Many patients with cataracts are demanding an option that will assist them with activities such as reading, utilize their computers at intermediate distance and view things that are at a far distance. The data from the FDA approval process reveals that patients who get the Symfony Intraocular lens were more able to attain enhanced intermediate as well as near vision while retaining similar distance vision compared with subjects who get a standard IOL. Surgery remains free of sutures. New for 2016! LASER dissolution of floaters is here at Yasgur Eye Associates. The ELLEX Laser corporation developed a Q-switched laser for this procedure over a 10 year period, and the FDA gave its approval. We can now dissolve those large shadows and clumps from the middle of your vision with an office procedure that has an impressive NO-HARM safety record. Dr.Yasgur has now performed dozens successfully, with NO HARM DONE. Learn more about this procedure and see educational videos at the Ellex Website. Adeno-Plus Test for 'Pink-Eye' Virus - A test that will determine if your pink-eye is the highly contagious and long-lasting form, or the form we can treat and get rid of very quickly. It takes just a small sample of your tears, and 2 minutes. Many procedures are performed in our office to avoid the inconvenience of using hospital operating rooms: abscess removal, astigmatism reduction, and eyelid surgery are only a few of the procedures performed on-site. 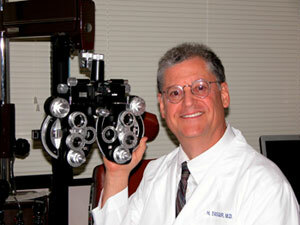 Routine exams, disease exams, disease treatments, lasers, surgery, contact lenses, eyeglasses. Extended exams for evaluation of diabetes, glaucoma, cataract, macular health, dry eye; with diagnostic services on site to assist in efficiency, convenience, affordability, with insurance coverage in almost all cases. Evaluation of pain, redness, loss of vision, floaters, lumps, bumps, injury, drug toxicity. Cataract surgery with no-stitches, Folding Implant Lenses, Advanced Technology Implant Lenses with Laser and OCT supplementation for advanced technology care. Our evaluation for even the most basic choice of service includes some of the most advanced technology available. Femtosecond Laser Assisted Cataract Surgery with LenSx® laser by Alcon® has been added to our practice. With the patented soft-touch docking system and optical coherent tomography guidance for precision at every stage, the LenSx® laser is used in more cataract surgeries worldwide than any other femtosecond laser. This option enables great reduction of mechanical and thermal manipulation to eyes during cataract surgery and enables more precise correction of astigmatism than ever before. Ask about this option for your cataract treatment and astigmatism reduction. Visit the LenSx website to learn more. Anti-VEGF and other injection treatments for Macular Degeneration, Diabetic Eye Diseases, Vein Occlusion, and Lasers for supplemental care. Using various injection treatments , we have found that even stages of proliferative diabetic retinopathy can be improved. Cool Lasers for Glaucoma, Retina diseases, After Cataracts, Laser Vision Correction, and even parts of the cataract operation. We now offer FDA-approved laser dissolution of floaters. We offer an advanced evaluation for the Dry Eye Diseases, with an exceptionally high cure rate. Testing begins with TearLab Tear Osmolarity, which is recognized by the American Academy of Ophthalmology as a high quality index to follow for measurement.